Then they took Jonah and threw him overboard. And the stormy sea became calm. When the men saw what had happened, they began to have great respect for the Lord. They offered a sacrifice to him. And they made promises to him. But the Lord sent a huge fish to swallow Jonah. 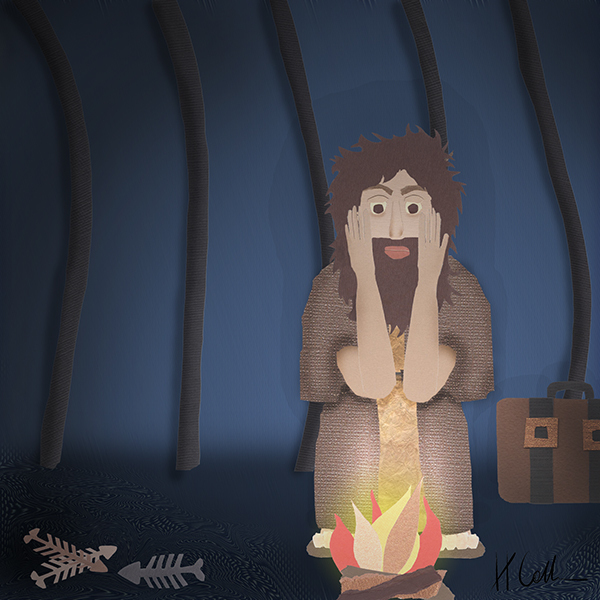 And Jonah was inside the fish for three days and three nights. The sailors finally realize that there is nothing they can do to save their ship. So they pick Jonah up and heave him over the side. And the storm stops! They are amazed. They now have been introduced to the God of the universe, and they begin to celebrate. The above translation “began to have great respect for the Lord” uses the same word Jonah used in 1:9: yare’. It means to worship. After seeing God’s power, these sailors worship God, make sacrifices, and make promises to God. They have, in fact, acted as Jonah should have. In the meantime, Jonah is struggling in the water, watching the ship get smaller and smaller. He probably thought that he would quickly die in that open sea, far from land. His death would have been the final refusal of God’s will. But Jonah does not get the release that he sought. In a deeply ironic twist, this prophet who should have been a “fisher of men” for God in Nineveh — he is now a man who has been caught up by a fish. When have you been in what seemed to be a hopeless situation? This entry was posted in Jonah, Pondering Scripture and tagged God, hope, Jonah, worship. Bookmark the permalink.